Allied Racing Stable LLC’s By My Standards earned 100 points on the Road to the Kentucky Derby following his upset tally in Saturday’s $1 million Louisiana Derby (G2) at Fair Grounds. The sophomore colt picked up his initial stakes triumph with a three-parts of a length victory under regular rider Gabriel Saez. By My Standards began his career in November and rallied from well off the pace to finish second in a 6 1/2-furlong dash in the slop at Churchill Downs. The bay colt was runner-up to the talented Jersey Agenda on the day, and he would come back to finish second-best once again against maiden special eight foes at Fair Grounds in his route debut. The Kentucky-bred kicked off 2019 in a similar spot at Fair Grounds and could only muster a third-place result after leading into the stretch. He broke through in the second assignment of his sophomore campaign, however, overcoming the 12 post to run clear from a solid special weight group with a convincing late burst. Trained by Bret Calhoun, By My Standards was making his graded debut on Saturday and ran like a seasoned veteran. The son of Goldencents tracked the moderate early pace and rallied inside of his main rival to post his biggest win to date. By My Standards had flashed potential from the word go, but he has really turned the corner in his last pair of assignments. The colt achieved a lifetime best 102 BRIS Speed rating in the Louisiana Derby, which also included a substantial 102 BRIS Late Pace figure. The $150,000 juvenile purchase was bred by Don Ladd and is the first stakes winner produced from the multiple-stakes scoring Muqtarib mare, A Jealous Woman, who is also responsible for an unraced two-year-old colt named Gentle Soul. From a pedigree perspective, the winner is not bred for greatness and he has a lot of speed influences throughout his bloodlines. However, By My Standards was full of run late going nine furlongs on Saturday and is outrunning his catalog page. 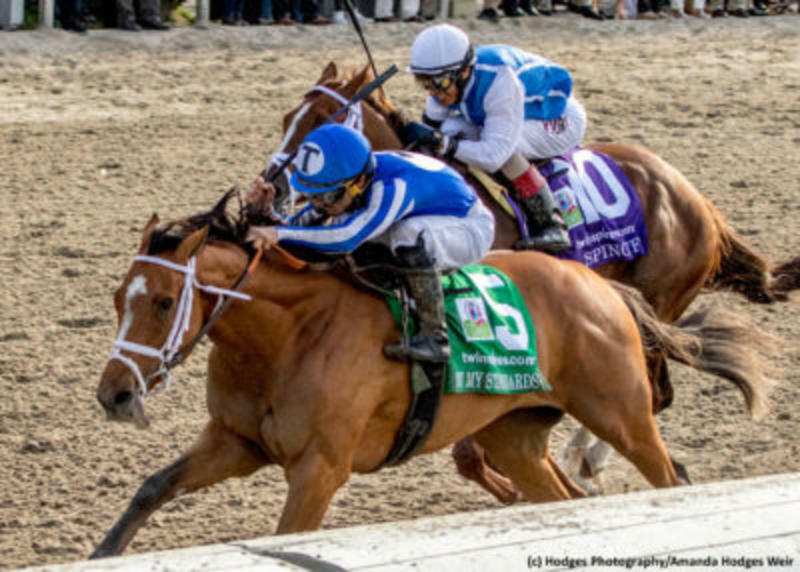 I would prefer to see the colt back up his 22-1 upset to prove his class and ability at the highest level prior to the Run for the Roses, though he is likely to train up to the Kentucky Derby on May 4. I take nothing away from his improving form but I consider By My Standards to be something of a Triple Crown outsider at this juncture.